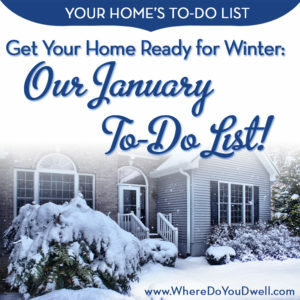 Our series will spotlight what tasks you should tackle at certain times of the year to make sure your home is well-maintained. Remember, that a well-cared for home is more likely to retain its value and avoid costly disasters. In addition to our basic maintenance reminders, we also suggest ways you can “Dwell” happily in your home! Even though it was a warm December, the DC metro area can be hit with a big chill even in March! Don’t delay in winterizing your home right now if you haven’t already. Our tips, including some DIY projects, will keep you and your home all set for the next winter snowfall or one of our legendary ice storms. And, don’t forget, by making your home more energy-efficient, you can save money! These tasks can be simple DIY projects that can keep your home toasty and warm without having to crank up the heat. If you have an older, drafty home, this is a definite for you. Switch out summer screens and install storm windows if you have them. Switch to heavier curtains or shades during the wintertime to help keep rooms warm. Before you sit by the fire, you’ll want to double check our list below. You don’t want to have any nasty surprises or create a fire hazard. Close the damper when not in use, but don’t forget to open it before lighting a fire. Buy firewood but store if away from the exterior of your home. Many creatures like to make woodpiles their winter home. Consider getting a gas fireplace if you have a gas line. They look much more realistic than ever and are easy to switch on and off. No one wants to wake up in a bitter cold home. Do these now so you can relax over the winter months or head out of town with no worry about freezing pipes. Hire a HVAC professional to inspect and clean your furnace. Better yet, have a contract with a company that you can contact in case of an emergency outage, so that they’ll respond more quickly since you’re a dedicated customer. Stock up on furnace filters and change them monthly. Can’t make it to a local store or buy bulk at Costco, you can order these online to be delivered to your door! Drain air conditioning pipes and turn off its shut-off valve if you have one. Hire a professional to inspect ducts for leaks in their joints; and have them cleaned if necessary. Remove and store window AC units. These easy tasks can go a long way in saving energy and convenience. Buy a programmable thermostat that allows you to set temperatures lower when you’re not at home or sleeping. There are so many smart technology options out there when it comes to thermostats, so shop around. The outside of your home is where harsh winter storms and cold weather can do damage. Get these outside tasks done right now before frigid weather hits. With leaves coming down later into December, take the time now to make sure gutters and downspouts are cleaned out thoroughly. Water can freeze, causing them to detach from your home. This can also cause major water damage to your home! Trim tree branches that hang too close to your home or electrical wires to avoid causing power outages. Cover outdoor furniture or store it inside. Do the same with sensitive potted plants. Seal foundation cracks to prevent mice sneaking in. Sometimes eco-friendly composite decks and stairs can be more slick and hazardous when ice forms. Be careful since it might not be obvious! When storms hit the DC metro area, many neighborhoods lose power. Be ready with these tips. Store flashlights, a first-aid kit, and extra batteries in easy-to-reach locations. Consider getting some battery-operated candles instead of real candles to prevent any fire risk. Make sure your cell phone is charged if a storm is forecasted. Keep extra water bottles, nonperishable food (for babies and pets too! ), blankets and necessary medications on hand. Check that you have a working shovel and bags of ice-melt (pet friendly brands!) or sand so you’re ready for snow and ice. Consider getting a generator if your home or neighborhood loses power more often. It could be worth the money and might be needed if you have small children. Place the generator at least 20 feet from your house. Find the phone numbers and website of your utility companies. Post it somewhere for easy access. Make sure your home doesn’t have any unsuspecting hazards. We’ve already mentioned cleaning your chimney, getting your heating units inspected but there are other steps to include on your list. Install a Carbon Monoxide (CO) detector to alert you of the presence of the deadly, odorless, colorless gas, which causes headaches, nausea, and disorientation. Check batteries monthly. Be careful with space heaters. Make sure you don’t leave them on and don’t use extension cords. We hope you’ve found our tips a helpful way to enjoy a safe, cozy, and happy 2017 winter! Here’s a handy PDF List that you can access from your smart phone or print out.